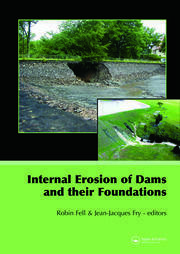 Validation of Dynamic Analyses of Dams and Their Equipment is the outcome of a three year cooperation program between CFBR (Comite Francais des Barrages et Reservoirs or French Committee on Large dams) and JCOLD (Japan Commission on Large Dams), and focusses on the dynamic behavior of concrete and embankment dams analyzed based on acceleration records of the JCOLD data base. 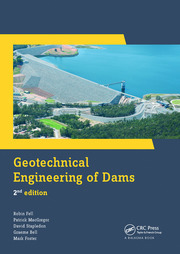 The book covers a broad range of topics, including simplified and detailed methods of dynamic analysis for the seismic response of concrete and embankment dams compared with measured behavior. The response of embankment dams subjected to a 1.0 g foundation acceleration time history is computed by several analytical methods and compared. The modelling of stress-strain behavior of compacted soils for seismic stability analysis of earth-fill dams and its application for a failed earthfill dam is described. The cracking of the face slab of four faced rockfill dams during earthquakes is analyzed. The seismic behavior of concrete arch dams is discussed by the comparison of numerical and experimental results. Displacement-based seismic assessment of concrete dams is presented. Finally the book contains a comparison between the Japanese and French design criteria of gates and a comparison of the analysis of gates and field measurements. 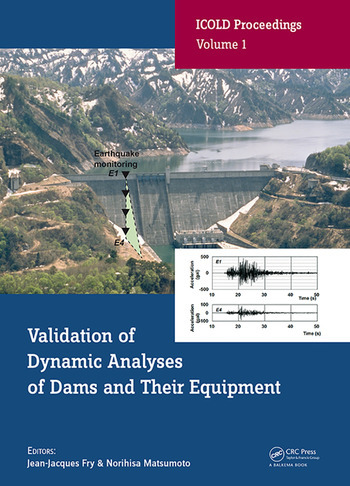 Validation of Dynamic Analyses of Dams and Their Equipment will be useful to professional and academics involved or interested in dam engineering. Jean-Jacques Fry works at Électricité de France, Centre Ingeniérie Hydraulique (EDF-CIH) in Le Bourget-du-Lac, France & EURCOLD Working Group on Dams and Earthquakes. Norihisa Matsumoto works at the Japan Commission on Large Dams (JCOLD) in Tokyo, Japan.